Dr. Shallenberger MD has been offering Ozone Therapy to his patients in clinical practice for over 30 years, and has been teaching practitioners in North America and around the world how to use ozone for over 25 years. He processes both the background theoretical knowledge and also the vast clinical experience to have earned the title of “Godfather of Ozone” in North America. His impact in this area of medical science can not be overstated, and is sometimes referred to as revolutionary. 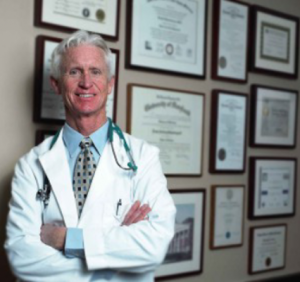 Dr. Shallenberger has performed his own clinical research into Ozone Therapy, and has published several clinical studies in peer reviewed journals. He is the “Teacher’s teacher” as many of his former students have gone on to teach other practitioners the proper methods of applying Ozone Therapy in clinical practice. Dr. Shallenberger also has the rare talent of also being able to convey these ‘medical science’ concepts and the proper ways to use ozone in a relaxed and easy manner that makes it easy for everyone to understand. This makes him the perfect author to introduce you to the phenomenal world of Ozone Therapy. Not content to simply utilize ozone in a traditional methods that have been used for 100 years, Dr. Shallenberger developed a new area of Ozone Therapy referred to as Prolozone®. Prolozone® is an injection technique that has been shown to regenerate damaged joints, herniated discs, and degenerated joints, tendons, and soft tissues. He has just published the first paper on Prolozone Therapy in the Journal of Prolotherapy entitled, Prolozone – Regenerating Joints and Eliminating Pain. Dr. Shallenberger’s deep understanding of cell biology and ability to think ‘outside the box’ enabled him to revolutionized the practice of anti-aging and preventive medicine by developing a method to measure mitochondrial function and oxygen utilization. He has written two popular books describing this method, The Type 2 Diabetes Breakthrough and Bursting With Energy, and has authored numerous papers in the international peer reviewed literature on ozone therapy and oxygen utilization. He is also the editor of Second Opinion alternative medical newsletter, a monthly newsletter written for the home health enthusiast and professionals alike. Dr. Shallenberger has just finished publication of his new book on ozone therapy entitled, The Ozone Miracle, written specifically for home users of ozone who want to ensure that they use ozone in a safe and effective manner, available at www.amazon.com. Dr. Shallenberger has just formed and incorporated the first medical ozone society in the United States, The American Academy of Ozonotherapy (see aaot.us). He serves as president of the academy.